Mediterranean influences create an elegantly approachable and welcoming dining room in St. Claire. A Rustic Pine finish lends a rich, warm hue to the pine solids and veneers with handsome matte black with pewter highlights hardware and accents. 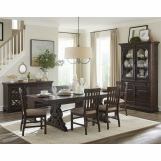 The trestle style extension dining table features ornately carved vertical column-like pedestals with a shaped Iron stretcher and expands from 80” to a total of 112” with two 16” center leaves. The server appeals with unique glass doors with wood spatter overlays and is chock full of storage with interior adjustable shelves while the curio cabinet lends further storage and handsome display space behind glass doors with clipped corner wood framing. 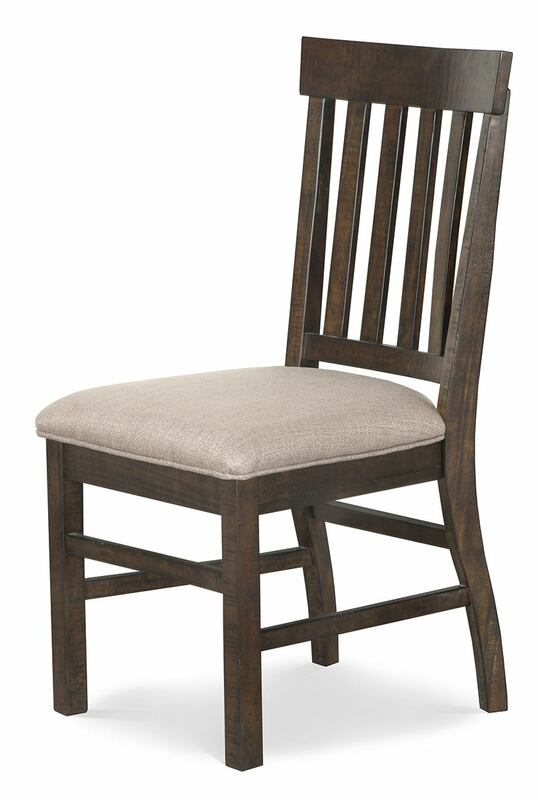 Seating for the collection includes a straight leg, vertical slat back dining chair and church pew style panel back wooden bench for hospitable options galore. This St. Claire Collection item features a video.